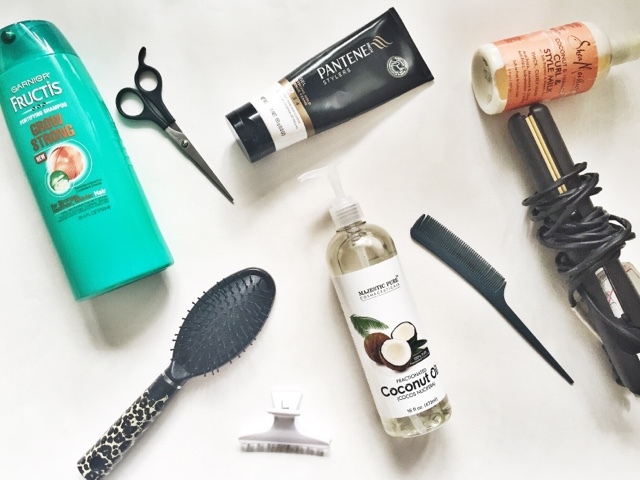 There is nothing like finding haircare products that you love. I have tried many but there are a few that I continuously use on a daily or weekly basis. What are your favorite go to products? Having naturally coarse curly hair, that is not chemically straightened, makes detangling my hair a process. So my number one go to hair care product is a conditioner with a lot of "slip". All my naturals know what I mean by slip. A conditioner that can coat wet hair and have just enough oils and thickness to it, for you to be able to comb through your hair to get out the tangles. 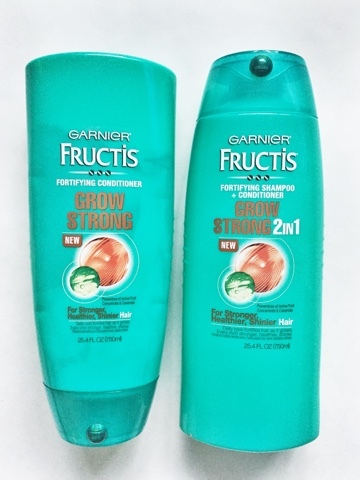 One brand that I really enjoy is the Garnier Fructis Grow Strong (conditioner here, shampoo here). I love this brand because it is super affordable and can be found at any local drug store. It gives the right amount of protection from breakage so that it is easier to detangle your hair while wet. It also adds a ton of moisture to combat dryness. I use the Grow Strong conditioner as a leave in when I do my wash and goes and also when I put my hair up in a ponytail. Some other Garnier products that I add to the mix sometimes are the Triple Nutrition line (favorites here, here, and here). This line is great and definitely worth trying if you have very dry hair that is prone to breakage. Adding moisture and sealing your hair with oils is a curly girls best tip to combat fizziness. Coconut oil is one of my favorite types of oil to use in my hair. Coconut Oil adds luster, shine and softens the driest of hair. It stimulates hair growth, while preventing breakage. 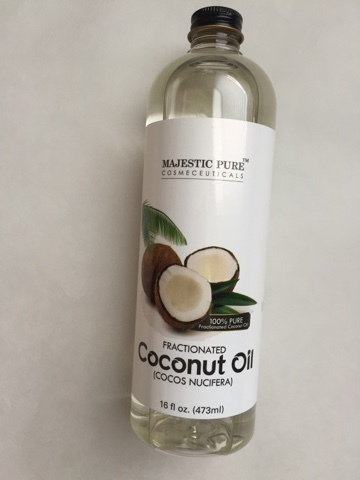 One brand of coconut oil that I have been using lately and really like is the Majestic Pure Fractionated Coconut Oil (found here). Since it is fractionated it does not become solid which makes it easy to add to your hair. I have been using this product as a deep conditioning oil treatment before I wash my hair and it has helped keep my hair moisturized over a period of days. Majestic Pure coconut oil comes with screw on top and pump for easy access and transport. Not only is it great for moisturizing hair it is great for your skin too, such as, eye makeup remover, massage, natural deodorant. and shaving cream. While you are waiting that half an hour to an hour for the coconut oil to deep condition your hair you can definitely do some at home spa treatments with it. 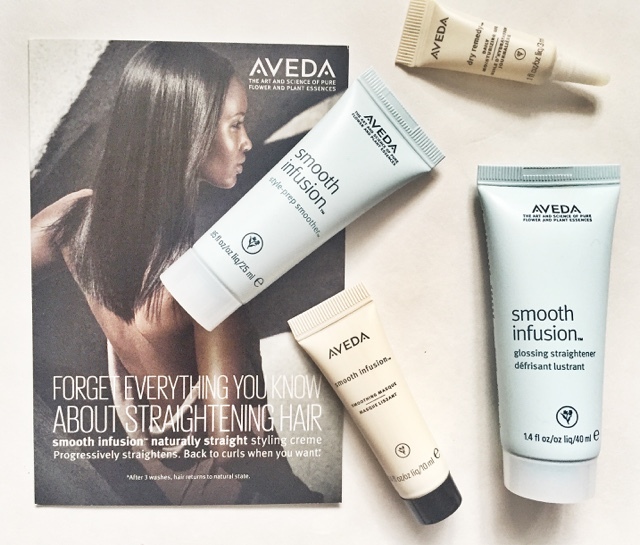 Other great products I will be trying soon are the Aveda Smooth infusion line (find all the products here). I hear this line is good for straightening your hair. I cannot wait to try, review coming soon. Stay tuned!